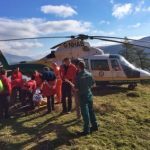 Incident Details: A 12 year old boy landed awkwardly whilst descending the crag by the Arthur Leonard memorial, and aggravated a previous injury, thought to be a medial knee ligament. He was in some pain, and unable to load bear on the leg. The Team administered analgesia, and stretchered him down to the road. He was then loaded into the Team Sprinter ambulance, and transported to Keswick Cottage Hospital for assessment. 18 members – 1 hour 45 minutes.